Acebutolol HCl, USP is a selective, hydrophilic beta-adrenoreceptor blocking agent with mild intrinsic sympathomimetic activity for use in treating patients with hypertension and ventricular arrhythmias. It is marketed in capsule form for oral administration. Acebutolol HCl capsules, USP are provided in two dosage strengths which contain 200 mg or 400 mg of acebutolol as the hydrochloride salt. The inactive ingredients present are D&C Red 28, D&C Yellow 10, FD&C Blue 1, FD&C Red 40, gelatin, maize starch, povidone, stearic acid and titanium dioxide. Acebutolol HCl, USP is a white or slightly off-white powder freely soluble in water, and less soluble in alcohol. Chemically it is defined as the hydrochloride salt of (±) N-[3-Acetyl-4-[2-hydroxy-3-[(1-methylethyl) amino]propoxy]phenyl] butanamide. Î²1-cardioselectivity has been demonstrated in experimental animal studies. In anesthetized dogs and cats, acebutolol is more potent in antagonizing isoproterenol-induced tachycardia (Î²1) than in antagonizing isoproterenol-induced vasodilatation (Î²2). In guinea pigs and cats, it is more potent in antagonizing this tachycardia than in antagonizing isoproterenol-induced bronchodilatation (Î²2). ISA of acebutolol has been demonstrated in catecholamine-depleted rats by tachycardia induced by intravenous administration of this agent. A membrane-stabilizing effect has been detected in animals, but only with high concentrations of acebutolol. Clinical studies have demonstrated Î²1-blocking activity at the recommended doses by: a) reduction in the resting heart rate and decrease in exercise-induced tachycardia; b) reduction in cardiac output at rest and after exercise; c) reduction of systolic and diastolic blood pressures at rest and post exercise; d) inhibition of isoproterenol-induced tachycardia. Significant reductions in resting and exercise heart rates and systolic blood pressures have been observed 1.5 hours after acebutolol administration with maximal effects occurring between 3 and 8 hours post-dosing in normal volunteers. Acebutolol has demonstrated a significant effect on exercise-induced tachycardia 24 to 30 hours after drug administration. The antihypertensive effect of acebutolol has been shown in double-blind controlled studies to be superior to placebo and similar to propranolol and hydrochlorothiazide. In addition, patients responding to acebutolol administered twice daily had a similar response whether the dosage regimen was changed to once daily administration or continued on a b.i.d. regimen. Most patients responded to 400 to 800 mg per day in divided doses. The antiarrhythmic effect of acebutolol was compared with placebo, propranolol, and quinidine. Compared with placebo, acebutolol significantly reduced mean total ventricular ectopic beats (VEB), paired VEB, multiform VEB, R-on-T beats, and ventricular tachycardia (VT). Both acebutolol and propranolol significantly reduced mean total and paired VEB and VT. Acebutolol and quinidine significantly reduced resting total and complex VEB; the antiarrhythmic efficacy of acebutolol was also observed during exercise. Acebutolol is well absorbed from the GI tract. It is subject to extensive first-pass hepatic biotransformation, with an absolute bioavailability of approximately 40% for the parent compound. The major metabolite, an N-acetyl derivative (diacetolol), is pharmacologically active. This metabolite is equipotent to acebutolol and in cats is more cardioselective than acebutolol; therefore, this first-pass phenomenon does not attenuate the therapeutic effect of acebutolol. Food intake does not have a significant effect on the area under the plasma concentration-time curve (AUC) of acebutolol although the rate of absorption and peak concentration decreased slightly. Acebutolol hydrochloride capsules, USP are indicated for the management of hypertension in adults. It may be used alone or in combination with other antihypertensive agents, especially thiazide-type diuretics. Acebutolol hydrochloride capsules, USP are indicated in the management of ventricular premature beats; it reduces the total number of premature beats, as well as the number of paired and multiform ventricular ectopic beats, and R-on-T beats. Acebutolol HCl, USP is contraindicated in: 1) persistently severe bradycardia; 2) second- and third-degree heart block; 3) overt cardiac failure; and 4) cardiogenic shock (seeWARNINGS). Sympathetic stimulation may be essential for support of the circulation in individuals with diminished myocardial contractility, and its inhibition by Î²-adrenergic receptor blockade may precipitate more severe failure. Although Î²-blockers should be avoided in overt cardiac failure, acebutolol can be used with caution in patients with a history of heart failure who are controlled with digitalis and/or diuretics. Both digitalis and acebutolol impair AV conduction. If cardiac failure persists, therapy with acebutolol should be withdrawn. In patients with aortic or mitral valve disease or compromised left ventricular function, continued depression of the myocardium with Î²-blocking agents over a period of time may lead to cardiac failure. At the first signs of failure, patients should be digitalized and/or be given a diuretic and the response observed closely. If cardiac failure continues despite adequate digitalization and/or diuretic, acebutolol therapy should be withdrawn. Following abrupt cessation of therapy with certain Î²-blocking agents in patients with coronary artery disease, exacerbation of angina pectoris and, in some cases, myocardial infarction and death have been reported. Therefore, such patients should be cautioned against interruption of therapy without a physicianâ€™s advice. Even in the absence of overt ischemic heart disease, when discontinuation of acebutolol is planned, the patient should be carefully observed, and should be advised to limit physical activity to a minimum while acebutolol is gradually withdrawn over a period of about two weeks. (If therapy with an alternative Î²-blocker is desired, the patient may be transferred directly to comparable doses of another agent without interruption of Î²-blocking therapy.) If an exacerbation of angina pectoris occurs, antianginal therapy should be restarted immediately in full doses and the patient hospitalized until his condition stabilizes. Treatment with Î²-antagonists reduces cardiac output and can precipitate or aggravate the symptoms of arterial insufficiency in patients with peripheral or mesenteric vascular disease. Caution should be exercised with such patients, and they should be observed closely for evidence of progression of arterial obstruction. PATIENTS WITH BRONCHOSPASTIC DISEASE SHOULD, IN GENERAL, NOT RECEIVE A Î²-BLOCKER. Because of its relative Î²1-selectivity, however, low doses of acebutolol may be used with caution in patients with bronchospastic disease who do not respond to, or who cannot tolerate, alternative treatment. Since Î²1-selectivity is not absolute and is dose-dependent, the lowest possible dose of acebutolol should be used initially, preferably in divided doses to avoid the higher plasma levels associated with the longer dose-interval. A bronchodilator, such as theophylline or a Î²2-stimulant, should be made available in advance with instructions concerning its use. Î²-blockers may potentiate insulin-induced hypoglycemia and mask some of its manifestations such as tachycardia; however, dizziness and sweating are usually not significantly affected. Diabetic patients should be warned of the possibility of masked hypoglycemia. Î²-adrenergic blockade may mask certain clinical signs (tachycardia) of hyperthyroidism. Abrupt withdrawal of Î²-blockade may precipitate a thyroid storm; therefore, patients suspected of developing thyrotoxicosis from whom acebutolol therapy is to be withdrawn should be monitored closely. Studies on the effect of acebutolol in patients with renal insufficiency have not been performed in the U.S. Foreign published experience shows that acebutolol has been used successfully in chronic renal insufficiency. Acebutolol is excreted through the GI tract, but the active metabolite, diacetolol, is eliminated predominantly by the kidney. There is a linear relationship between renal clearance of diacetolol and creatinine clearance. Therefore, the daily dose of acebutolol should be reduced by 50% when the creatinine clearance is less than 50 mL/min and by 75% when it is less than 25 mL/min. Acebutolol should be used cautiously in patients with impaired hepatic function. Patients, especially those with evidence of coronary artery disease, should be warned against interruption or discontinuation of acebutolol therapy without a physicianâ€™s supervision. Although cardiac failure rarely occurs in properly selected patients, those being treated with Î²-adrenergic blocking agents should be advised to consult a physician if they develop signs or symptoms suggestive of impending CHF, or unexplained respiratory symptoms. Acebutolol, like other Î²-blockers, has been associated with the development of antinuclear antibodies (ANA). In prospective clinical trials, patients receiving acebutolol had a dose-dependent increase in the development of positive ANA titers, and the overall incidence was higher than that observed with propranolol. 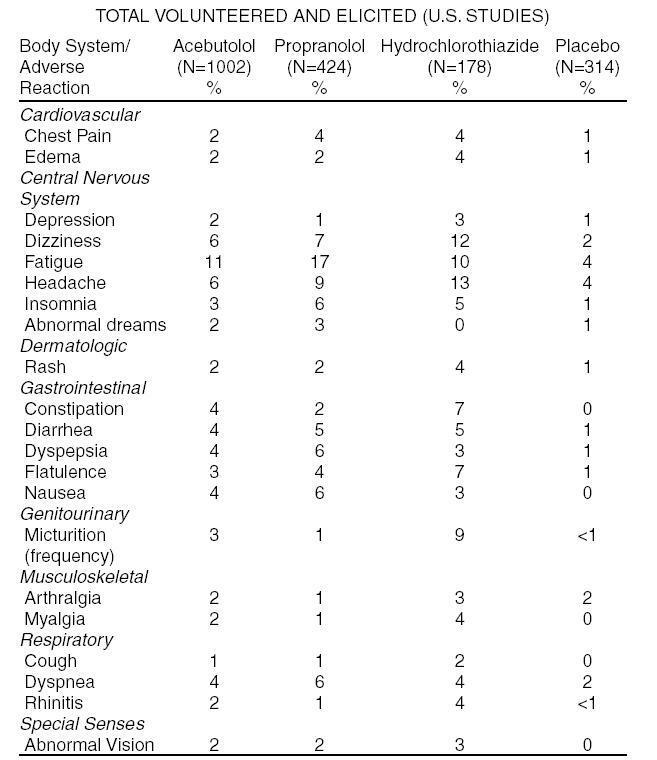 Symptoms (generally persistent arthralgias and myalgias) related to this laboratory abnormality were infrequent (less than 1% with both drugs). Symptoms and ANA titers were reversible upon discontinuation of treatment. Catecholamine-depleting drugs, such as reserpine, may have an additive effect when given with Î²-blocking agents. Patients treated with acebutolol plus catecholamine depletors should, therefore, be observed closely for evidence of marked bradycardia or hypotension which may present as vertigo, syncope/presyncope, or orthostatic changes in blood pressure without compensatory tachycardia. Exaggerated hypertensive responses have been reported from the combined use of Î²-adrenergic antagonists and Î±-adrenergic stimulants, including those contained in proprietary cold remedies and vasoconstrictive nasal drops. Patients receiving Î²-blockers should be warned of this potential hazard. Chronic oral toxicity studies in rats and mice, employing dose levels as high as 300 mg/kg/day, which is equivalent to 15 times the maximum recommended (60 kg) human dose, did not indicate a carcinogenic potential for acebutolol. Diacetolol, the major metabolite of acebutolol in man, was without carcinogenic potential in rats when tested at doses as high as 1800 mg/kg/day. Acebutolol and diacetolol were also shown to be devoid of mutagenic potential in the Ames Test. Acebutolol, administered orally to two generations of male and female rats at doses of up to 240 mg/kg/day (equivalent to 12 times the maximum recommended therapeutic dose in a 60-kg human) and diacetolol, administered to two generations of male and female rats at doses of up to 1000 mg/kg/day, had no significant impact on reproductive performance or fertility. The effect of acebutolol on labor and delivery in pregnant women is unknown. Studies in animals have not shown any effect of acebutolol on the usual course of labor and delivery. Clinical studies of acebutolol and other reported clinical experience is inadequate to determine whether there are differences in safety or effectiveness between patients above or below age 65. Elderly subjects evidence greater bioavailability of acebutolol (see CLINICAL PHARMACOLOGY - Pharmacokinetics and Metabolism), presumably because of age related reduction in first-pass metabolism and renal function. Therefore, it may be appropriate to start elderly patients at the low end of the dosing range (see DOSAGE AND ADMINISTRATION - Use in Older Patients). Persistent hypotension in spite of correction of bradycardia: Administer vasopressor (e.g., epinephrine, norepinephrine, dopamine, or dobutamine) with frequent monitoring of blood pressure and pulse rate. Bronchospasm: A theophylline derivative, such as aminophylline and/or parenteral Î²2-stimulant, such as terbutaline. The initial dosage of acebutolol in uncomplicated mild-to-moderate hypertension is 400 mg. This can be given as a single daily dose, but in occasional patients twice daily dosing may be required for adequate 24-hour blood-pressure control. An optimal response is usually achieved with dosages of 400 to 800 mg per day, although some patients have been maintained on as little as 200 mg per day. Patients with more severe hypertension or who have demonstrated inadequate control may respond to a total of 1200 mg daily (administered b.i.d. ), or to the addition of a second antihypertensive agent. Beta-1 selectivity diminishes as dosage is increased. The usual initial dose of acebutolol is 400 mg daily given as 200 mg b.i.d. Dosage should be increased gradually until an optimal clinical response is obtained, generally at 600 to 1200 mg per day. If treatment is to be discontinued, the dosage should be reduced gradually over a period of about two weeks. 200 mg: Hard gelatin capsules with bright orange opaque body printed radially â€œ669â€ with black ink and lavender opaque cap printed radially â€œAmnealâ€ with black ink. 400 mg: Hard gelatin capsules with bright orange opaque body printed radially â€œ670â€ with black ink and lavender opaque cap printed radially â€œAmnealâ€ with black ink. Protect from light. Keep tightly closed. Dispense in a tight, light-resistant container.